PLEASE TAKE NOTICE THAT at a time set by the Court at its earliest convenience Contestants will seek a temporary restraining order pursuant to Minn. R. Civ. P. 65.02 enjoining the Secretary of State's Office from redacting the absentee ballot envelopes associated with the 933 ballots opened and counted on January 3, 2009. This Motion will be based on the accompanying memorandum and all the files, records and proceedings herein. The Coleman campaign is simply requesting that each of the 933 wrongfully rejected absentee ballots remain individually identifiable. Their request is in opposition to the February 3rd stipulation instructing the SOS's Office to assimilate these ballots into the larger subset of all accepted absentee ballots. The Coleman campaign is seeking to halt the processing of that order. A review of the original stipulation places the Coleman campaign in a somewhat hypocritical position, but the circumstances have changed. The Election Contest Court presented seven categories of absentee ballots which they deemed worthy of future consideration; he ECC also denied King Banaian's Testimony. In light of these prior events, this latest notice seems strategically plausible. Deputy Secretary of State, Jim Gelbmann (who testified for three days) stated on Friday that about half of the 933 wrongfully rejected absentee ballots had already been redacted in accordance with the stipulation. These redactions are unlikely to impede Coleman's intention. 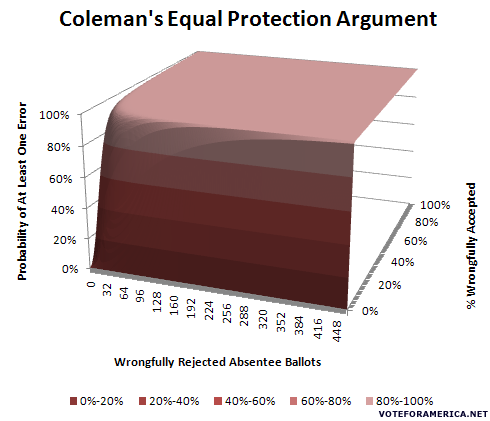 The Coleman campaign has signified that approximately 100 of the 933 wrongfully rejected absentee ballots were actually accepted in opposition to the newly established categories. The bottom line is this: if Coleman's request is granted and their error estimate is correct or even just partially correct, the already redacted ballots will play absolutely no role in their Equal Protection argument. If the examination occurs and no errors are found, there is a 69.7% chance that the singular error exists within the other half of already redacted ballots. If the motion is approved, this is a win-win for Coleman; he is either able to prove that inconsistencies occurred, or blame the lawful redaction for his troubles. Pursuant to Minn. R. Civ. P. 65.02, Contestants seek a temporary injunction preventing the Secretary of State's Office from redacting the envelopes associated with the 933 ballots counted on January 3, 2009. The Court should preserve the status quo until it determines the impact of its February 13, 2009 Order on absentee ballots already counted in the election, including those counted on January 3, 2009. Contestants seek the requested relief to preserve the status quo until the Court determines the impact of its February 13, 2009 Order on absentee ballots already counted in the election. The parties are involved in an election contest to determine which party received the highest number of legally cast votes and is therefore entitled to receive the certificate of election. Which votes are in fact legally cast is at the very heart of the matter-and of the Court's charge. Contestants believe the Court must apply its February 13, 2009 Order to absentee ballots previously counted, including those removed from the envelopes at issue here. The Court's February 3,2009 Order directs the Secretary of State's Office to redact the identifying numbers from the ballot envelopes so that a particular ballot can no longer be tied to the envelope it came in. Without that identifying information, the Court will be unable to determine which ballot was in fact an illegally cast vote and should not be included in the count of legally cast votes, thus removing an important remedy that would be available if the Court applies its February 13, 2009 Order to absentee ballots that have already been counted. For the reasons set forth above, Contestants respectfully request that this Court issue a temporary injunction directing the Secretary of State's Office not to redact any information from the envelopes associated with the 933 ballots opened and counted on January 3,2009 pending further order of this Court. Contestee Al Franken opposes Contestants' Motion for Temporary Injunction, The motion flies in the face of a Stipulation and Order freely entered into by the parties and affirmed by the Court. The Stipulation and Order settled and resolved one of Contestants' claims and furthered the strong public policy of ballot secrecy. Contestants' effort to renege on the stipulation they freely entered and eviscerate the binding order of this Court warrants the imposition of sanctions. 1. The relationship between the parties strongly cuts against an injunction. The relationship between the parties is governed by the Stipulation and Order of February 3, 2009. Contestants seek to breach the Stipulation, defy the Court Order entered on the stipulation, and make the Court a party to the breach. 2. Irreparable harm will result if the motion is granted. As the Supreme Court recognized in its Order of December 24, 2008, entered at the request of both Contestants and Contestee herein, ballot secrecy is a paramount public policy. Minnesota law mandates secret ballots. See Minn. Stat. § 206.80 ("An electronic voting system may not be employed unless it: (1) permits every voter to vote in secret ...."); see also Application of Andersen, 119 N.W.2d 1,8 (1962) ("Procedural statutes governing elections are intended to safeguard the right of the people to express their preference in a free election by secret ballot and to have the results of the election governed by the votes so cast. "); Minn. Stat. § 202A.18 (requiring secret ballots even for caucuses and conventions). The 933 ballots should never have been numbered. On February 3, 2009, recognizing this public policy, Contestants and Contestee freely entered into a Stipulation that the numbers would be removed. 3. Contestants will not prevail on the merits. 4. The public interest requires that the February 3 Order be enforced. 5. The burden on the Court by this motion is not administrative, but goes directly to the heart of the integrity of the judicial process. The motion should be denied. Contestee advised counsel for the Contestant that this motion is baseless and warrants the imposition of sanctions. Contestee requests that the Court establish a briefing and hearing schedule so that Contestee may bring on a motion under Minn. R. Civ. P. 11 and Minn. Stat. Section 549.211. After all of this, I find it unlikely that the Election Contest Court will override Coleman's once prejudiced dismissal of this very topic. Of the 1,585 presented by Franken 804 were not already identified by Coleman; this number is actually slightly more than the 792 he had already presented. This could mean several things, but it is impossible to definitively conclude anything without actually looking at the list which, should at the vary latest be available on Monday when the ECC resumes. what does "redaction of ballots" mean? The ballots were numbered so that they could be identified later in case they were challenged. Once both campaigns accepted the ballots and they were counted, the court ordered, and both campaigns agreed, that the Secretary of State would redact (block out or otherwise remove) the numbers on the ballots so the people who cast the ballots would remain anonymous. That's the key: the Coleman camp agreed to redact the ballots to protect anonymity. Now they are reversing course like they have done so many times before. I'd like to point out that the Star Tribune is not in bankruptcy due to lack of journalistic skills (which your snide comment implies), but because the private equity group which purchased the paper borrowed more money than they are now able to pay back.